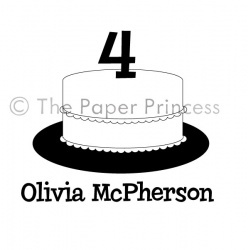 Home :: RUBBER STAMPS :: Holiday + Celebrations (5) :: Custom Birthday Cake: "Olivia"
Custom Birthday Cake Rubber Stamp: "Olivia"
Does a little someone have a birthday celebration coming up? Help your little loved one celebrate with this lovely birthday cake rubber stamp. Add the number of your choice from 1 to 100! Stamp this onto invites, tags, labels, goody bags, anything really! Other info: Stamp image measures 2" X 2". Image/text is deeply etched into our clear polymer to give you sharp, crisp images every time. What year for the candle?